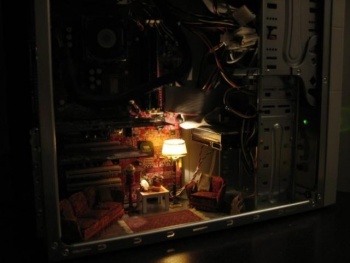 A Russian case modder has built a tiny living room inside a PC. There is really nothing more to be said. If you've ever heard the line "'Will you walk into my parlour?' Said the spider to the fly" and wondered what a spider's parlour might look like, then look no further. Yes, I appreciate you've probably never been all that bothered about spider parlours, but I have to write something to go with the picture or I'll get fired. The mod - a tiny room built inside a computer - is the work of a Russian modder known as 'newsmaker'. He says something about the mod here but as I don't speak Russian, I can't tell you what it is. Either way, the mod is so delightfully strange, that I felt compelled to share.